Insulation of the hull and deck is critical to comfortable and efficient cruising. It impacts noise levels from exterior and machinery, condensation in cold climates, and electric requirements for heating and air conditioning. With the FPB Series we take the insulation game to a new level. Good insulation adds weight, the material is costly, and labor for installation substantial. And you can’t just throw more of the same to solve problems. Much of the weight is high and impacts stability. 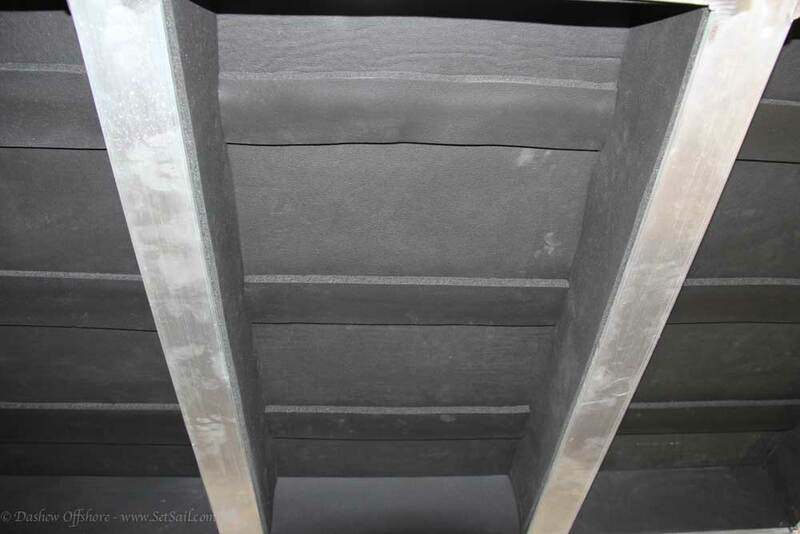 Extra thick insulation takes up space normally used for systems runs. But if you plan for it from the beginning of the design cycle, are careful with other weights, and integrate the insulation system with structural design, the result can pay substantial rewards. HVAC loads (heating and air conditioning) are reduced. 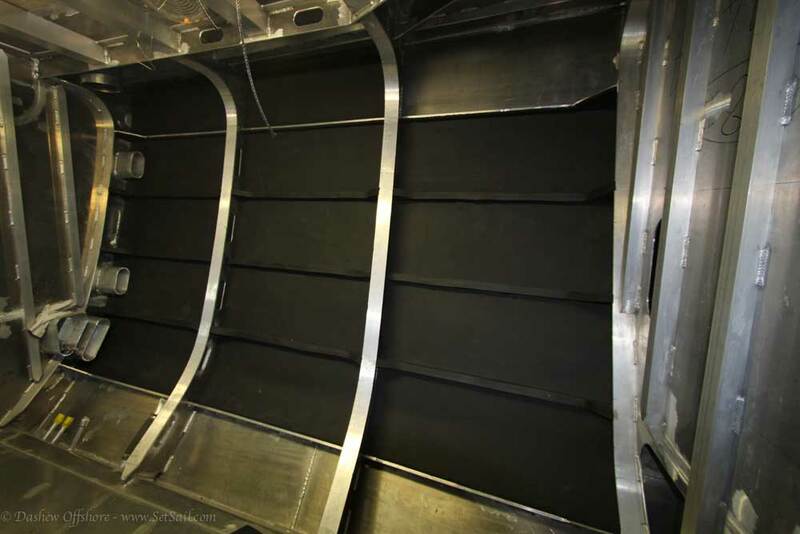 With the FPB 78 Series we are aiming for a 50% reduction in thermal loading. Integrate this with a large solar array backed by a massive traction battery bank, and the genset is relegated to backup status. 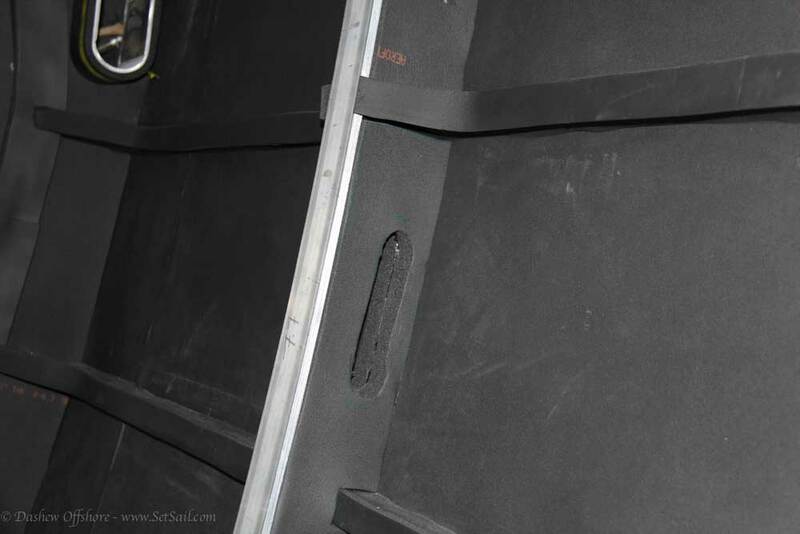 This material is an EPDM closed cell elastomeric, laminated with an aggressive self adhesive. 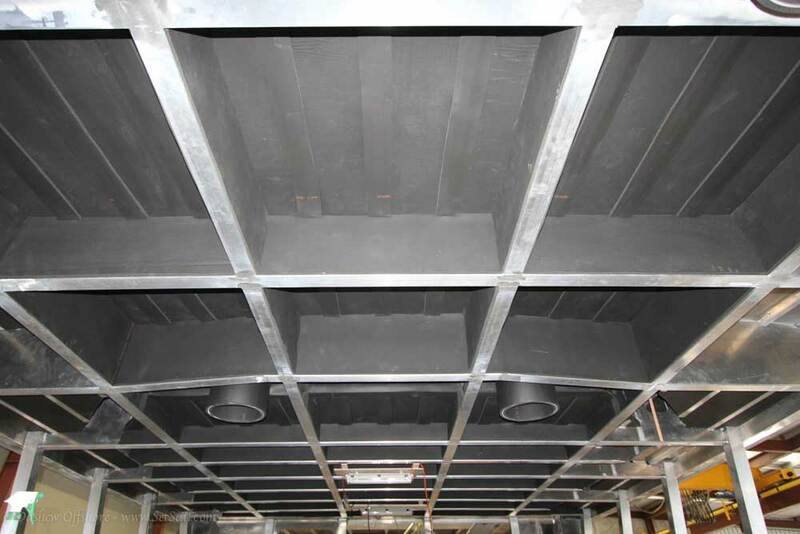 It is not only efficient as thermal insulation, but is an effective noise absorber. And it has very low moisture absorption characteristics. 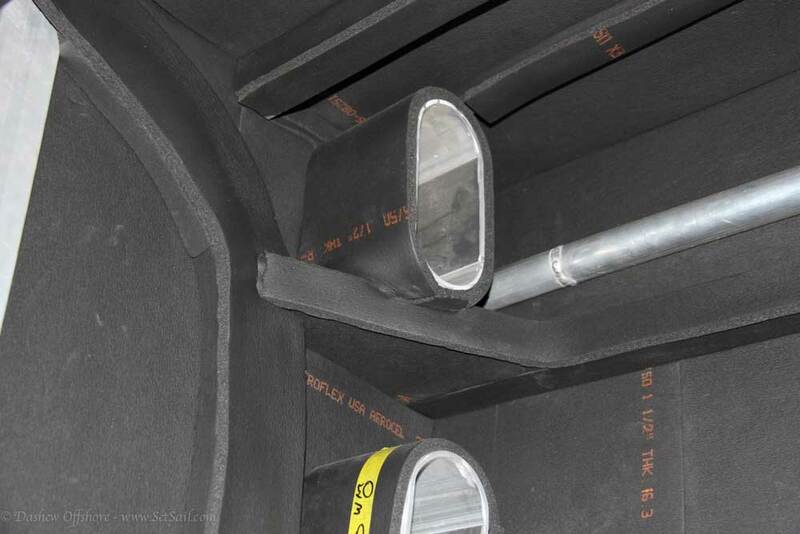 SetSail regulars will be familiar with our previous insulation efforts, considered by many to be industry leading. We invite your comparison with what we have shown you in the past. This new design should reduce heat loads by a minimum of 50% compared to our past efforts, with the possibility of even better results. This entry was posted on Wednesday, February 18th, 2015 at 9:53 pm and is filed under FPB 78, FPB Series Notes, The Logs, three. Both comments and pings are currently closed. Hi Steve: Given this insulation as well as the laminated windows, how suitable would the FPB-78 be to operate and even moor for months in locations with freezing weather during the winter? Carl, the issue is keeping plumbing from freezing, so the insulation reduces BTU needs. Depending on the weather, you might want an inner window liner for insulation. Is it possible to paint AST certified insulating paint under the foam insulation and even down to the bilges? If yes do you thing this approach offers any significant advantages? Not familiar with “AST”. More detail needed Nicolas. Sorry ASTM standards -American Society for testing and materials. A suitable paint would be Mascoat that seems to come with all the necessary certificates. We have experimented with Mascoat and find it does not add benefit insulation wise where we have the EPDM. One thing I’ve noticed and appreciated is the extreme tidiness of the product. This post and the last, especially the last with the wiring runs, shows no detail done in a “that’s good enough” way. Even the tie-wraps are done with care, evidently by someone taking great pride in their work. I’ve done enough new construction and refits to be able to say I dislike shipyards! Cira looks like one I would enjoy. As to this post, in pictures 1 and 4 I assume I’m looking at the hull to the center/right and a watertight bulkhead to the left. With the chase, how is it sealed once all piping and wiring is run? We’ll do a sealing bulkead at some point in the future. As an engine room bulkhead it has to be water/gas/fire tight. Love your boats and thoughtful design! Are there any concerns/issues with corrosion in an anoxic condition where condensation water gets trapped between the hull and the EPDM? We have not seen a problem with this, Ross. I’ve been reading your site since the first FPB and can’t thank you enough for sharing information like this! While I may never afford an FPB, the information I have taken and applied to our Silverton 40C has made an impressive difference to our comfort, cost of ownership and joy of use. this is why I have loved watching the builds of these boats for the past 10-12 years? Watching the planning, reasoning and build of Wind Horse was very pleasurable for this old boatie. My only complaint…. making me wait for three weeks for an update. Bravo Zulu to ALL the skilled people involved in every step of the process. With the aggressive self adhesive characteristic isn’t there a seal much like paint on Aluminium? and if yes don’t you risk same corrosion factor as with paint..i.e., unpainted no issue, painted some risk of corrosion under paint? second unrelated to 78…have you dialed in numbers yet on big sister…i wanted to know who got closest to the performance!! Re the 97 data and contest, hopefuly we will have time next week. Re paint and self adhesive, the issue is moisture and film adhesion. Good adhesion and/or lack of moisture = no problems. If no exposure to air then no condensation, right? Thus the good adhesion principle…. Very interesting. Is that 50% reduction in heat load a result of using the Aeroflex Afrocel instead of the Armaflex that you previously used or are you also using a thicker one? We are using two to three times the material and covering virtually everything. This is great stuff. I helped a friend insulate a van with it. We used the 1/2 inch on the roof & sides. It cut down sound levels drastically & works great for thermal insulation too. Just cut it to shape & stick it on. I shutter to think of the cost of doing an entire boat but it’s going to work great. You are going to like it. Just curious if you have you considered or worked with the spray on expanding polyurethane foams? At 2 lbs per cubic foot they have excellent weight to R value ratios and they stick pretty much forever. They would require conduits for any electrical and plumbing runs located within wall structure of course–but those are generally considered a best practice anyway, and would be less labor compared to all the cut and fit required for the self sticking foam. From my personal experience even the most dedicated craftsman using cut and place will not be able to get anywhere near the complete seal you get with expanding foams. Also the higher end modern variants don’t out gas and are available in fire retardant self extinguishing formulations. The installation equipment has some cost but this can be rented or amortized over several boats…it seems like it would compare favorably cost wise. Excellent sound absorption as well. Again, just curious if you have considered this approach to insulation. We have used these in the past and they have several drawbacks starting with moisture absorbtion over time. And when you have to make a repair its a mess. There is a weight and cost advantage compared to the EPDM sheet. But we favor the latter as it is easier to live with over time. Do you install the EPDM below the waterline and into the bilge areas also? It would seem that with a waterproof material that would be acceptable especially if the boat is expected to go into high latitudes. Or even to keep the warmer water of the tropics from radiating into the bilge, floor and living spaces. In living areas insulation is on the tank tops and within 150 mm of the margin plates on topsides leaving a very small area uninsulated.